Performance artist Thilo Garus is one of a new generation of artists and creatives who call Berlin their home. Born in Munich 1994 and based in the German capital for the last five years, Garus epitomises the coveted and flourishing diversity within Berlin’s ever-expanding creative scene. Since then, he’s been honing and expanding his multifaceted talent that traverses the realms of modelling, dancing, acting and performing. For artists like Garus, versatility is the name of the game, and flexibility—both in literal and symbolic terms—plays a central role in his work. Rehearsals and performances can take place at any time, day or night, and after-dark creativity is where Garus’ raw talent shines through. It’s apt, then, that when we meet the young artist, it’s on occasion of the Nite Jogger re-release by adidas Originals. 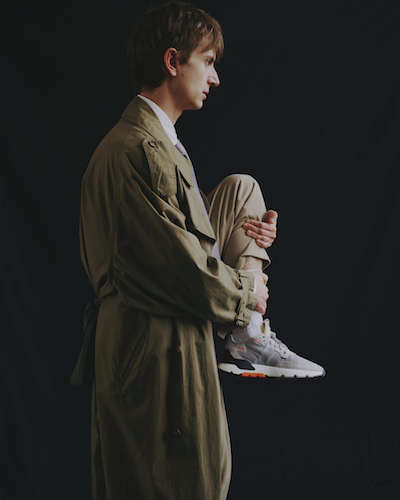 A purveyor of innovation and creativity itself, adidas conceives the shoe’s reflective silhouette as an essential stake for any night time creator. 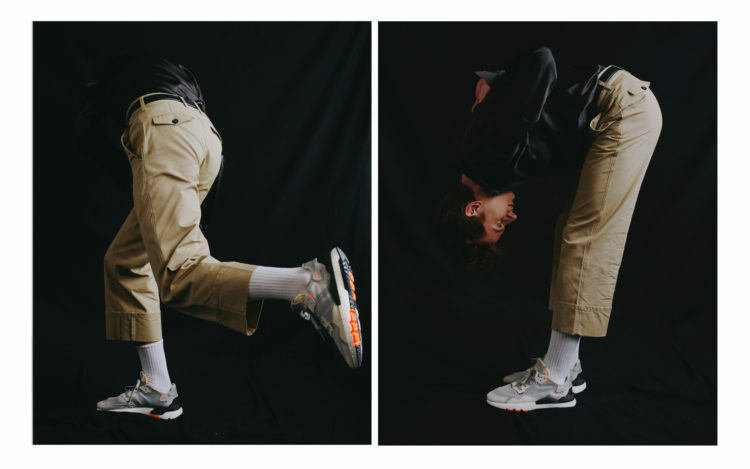 Kitted out and agile in the Nite Jogger, we talk to Garus about art, performance and the magic of movement. Though art has been a part of Garus’ life since childhood, he had never considered performing arts as a viable career option. “I started working as a performer in my spare time during my architecture studies,” Garus remembers. “I learned mostly from others.” It wasn’t until pioneering performance artist, Nationalgalerie Prize for Young Art-winner and Venice Biennale showstopper Anne Imhof approached Garus that life began to change. “It was my first ever gig,” Garus admits. “I guess she just found me.” The piece, Angst 2, presented at the Hamburger Bahnhof back in 2016, played out in the form of a mock-opera, in which audience members were able to disrupt the soundtrack with their mobile phones. Besides the value of looking after yourself, Garus has absorbed a wealth of life and career advice, owing to his diverse background. 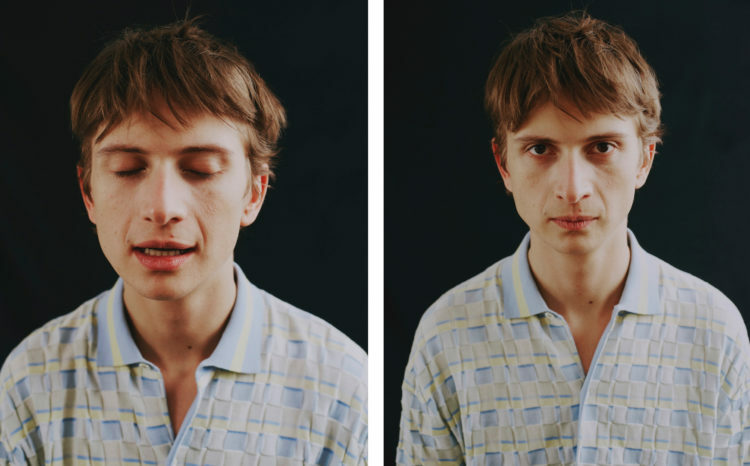 “The most valuable lesson I’ve learned is that it’s so important to have an open eye for interesting stuff that is happening around you and appreciate other people’s work,” he tells INDIE. “I’m such a fanboy of so many people and their work, weirdly enough sometimes more than my own, so I’m always humbled when people appreciate mine.” Collaborating with artists who inspire him, including Sam Desouza, Josh Johnson and Boychild, Garus keeps his work progressing and interesting, acknowledging and embracing the rich potential of learning from others. The adidas Originals Nite Jogger is available in stores globally on April 11 and online here.